Monfils admitted that Stepanek was “better than me today. . . He returned pretty deep and fast. . .then reached the net very fast. So it was hard to play my game”. Because of the narrow preparation window, MiamiTennisNews.com asked Monfils if he had any indication that he would not be at his peak while in practice. Monfils said “No. I had a good warm-up. . .I think I played good, but sometimes, the other guy plays better”. With this defeat, Monfils’ record in finals is now 3-11. Considering he’s such a gifted and talented individual, the questions is why. Monfils responded “my first [three] finals [were] impossible. . .I lost to [Roger] Federer, he was [ranked] number one, [Ivan] Ljubicic was number three and [Andy] Roddick number two. So, you can forget [those]. . . To be honest, I’m unlucky. Last year in the finals, I twisted my ankle. Today, I finished at 1:15 a.m.”. In his prior rounds, Monfils was willing to venture to the net quite a bit. A couple days ago Monfils was asked by MiamiTennisNews.com whether his coach was working on making him more offensive. Monfils answered “ I try , but sometimes, I need more confidence. . .I’m a good worker when I try to approach the net, but sometimes I don’t feel it. So I need to keep working on that”. Today there were only four visits to the forecourt. To celebrate his victory, Stepanek did ‘the worm’ on the court. He explained “I do it when I win tournaments”. At age 32, this victory is confirmation for Stepanek after “coming back from a lot of injuries with [self-belief] and hard work”, he can still compete with the ‘young guns’. Stepanek’s plan was to be offensive from the initial stroke “I wanted to be in control of the match. . .be the boss on court. . .I wanted to have the match in my hands. . .I was right to come to the net because that’s my game”. 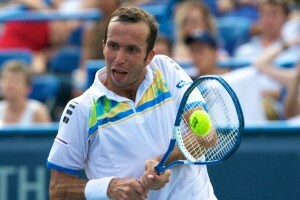 Stepanek is the senior of the ATP top 100 rankings. Prior to today, Juan Carlos Ferrero at 31 was the only person around that age to bank a title. Stepanek was asked about players winning titles at that age “we are like fine wine, the older we get, the better we are. . .Age doesn’t matter, it depends on how your [body] feels”. On Monday, Stepanek’s ranking will improve from 54 to around 30. His goal is to keep progressing as the U.S. Open nears. At number 7, Monfils is at the highest ranking of his career. His best showing at a major was the 2008 French Open semifinals. 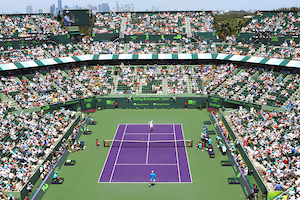 A few days ago, MiamiTennisNews.com inquired from the Frenchman what it will take to get to a final. Monfils answered “ I have to have confidence in myself, have a stronger belief. . . I’m a believer, but to reach the real top, I have to believe more. [For instance], now I’m practicing two hours, I need to increase by 30 minutes more. Even though it’s hard. . . I know I have the potential but sometimes, I forget. I say to myself this guy is playing good. I have to remind myself I’m playing good also. I show too much respect to my opponent. Maybe I need to be more selfish as well. There’s no truer testament to that statement than his performance today.